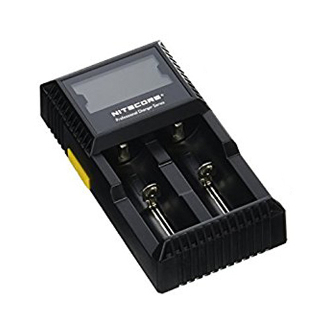 The Nitecore D2 is a two bay universal smart charger that can fit a wide variety of cylindrical batteries. It can auto detect the insertion of li-ion, ni-mh, and ni-cd batteries or through a manual selection you can also charge liFePO4 batteries. Its Smart technology selects the optimal charging mode for each given battery allowing the slots to monitor and charge the batteries independently. It will also shut itself off when the charging is complete. There's an lcd screen that displays your charging levels, voltage, current, and time.